Archaeologists and architects draw upon theoretical perspectives from their fields to provide valuable insights into the structure, development, and meaning of prehistoric communities. Architecture is the most visible physical manifestation of human culture. The built environment envelops our lives and projects our distinctive regional and ethnic identities to the world around us. Archaeology and architecture find common theoretical ground in their perspectives of the homes, spaces, and communities that people create for themselves. Although archaeologists and architects may ask different questions and apply different methods, the results are the same—a deeper understanding of what it means to be human. In this volume, prominent archaeologists examine the architectural design spaces of Mississippian towns and mound centers of the eastern United States. The diverse Mississippian societies, which existed between A.D. 900 and 1700, created some of the largest and most complex Native American archaeological sites in the United States. The dominant architectural feature shared by these communities was one or more large plazas, each of which was often flanked by buildings set on platform mounds. 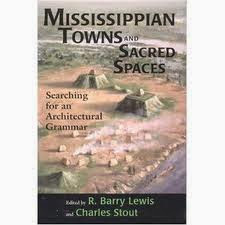 The authors describe the major dimensions of an architectural grammar, centered on the design of the plaza and mound complex that was shared by different societies across the Mississippian world. They then explore these shared architectural features as physical representations or metaphors for Mississippian world views and culture.